Which two sides? Do you intend *can* and me? I don't think we are in competition. I did this work with a cooperative spirit, and I think the same was for him. He has been the best interlocutor I could have find, because, beyond his technical talents, he remains open to give credit to the protagonists of this story, so compensating for my negative bias on them. This relieves me from the burden to find by myself all the possible objections to my own hypotheses. For the moment, unless *can* provides a third explanation, the two sides corresponds to the interpretation of the December 2010 test contained in the Unibo report and the one described by the graphs plotted by *can* on the basis of my indications. The scientific authority is entirely on the first side. Does it means that you stick with the interpretation reported by UniBo? Sorry if I gave the impression of pitting you two against each other as competitors. Since Doral, I do not believe any publicly released result from a Rossi demo. That includes the two tests at UOB being discussed. Neither do I think Levi, and those assisting him, ever expected their results to be taken as the final word either. They proposed further testing, which they accomplished first at Ferrara with the Hotcat, and again at Lugano. Lugano was a clear bust, and since it was a follow-up to Ferrara, I must conclude Ferrara was a bust also. Even though no one has determined yet what particular trick Rossi pulled there. That said, with the exception of Rossi having a hand in it someway, I do not think there was any intentional attempt during any of the tests, by those from the UOB to manipulate the data. And I am not accusing you of saying that! Without any of them willing to speak up, hard to make a case that the science says anything other than what you conclude. [...] If you have time and possibility, it would be useful to have a graph with the experimental data (power in and temperatures) plotted in function of the real local time, and starting from the presumed time when the data acquisition system was switched on, with these actions marked on it. I tried putting together another plot. I'm not entirely sure of the timeline you provided. I'm assuming there were at least two attempts at setting up the water flux. How much time would have passed between one and the other? A few minutes? By the way, I think they started earlier than 16:55. The photo doesn't show the entire plot. The top label "Grandezza naturale" should be roughly centered on the screen. Fine. Very nice graphs, as usual. I'll try to clarify your doubts. My hypothesis is that the period of 45 s, as period to fill the container, was chosen in order to make one calibration attempt every minute. The last could have been concluded immediately before the power on of the heaters at 17:22 ca. I don't know how many attempts there have been. We can assume 10 as order of magnitude. So the calibrations could have started at 17.12 ca. The previous half an hour could have been spent for filling the circuit, considering a total volume of about two liters and an initial flow rate of 1 g/s. These are all speculations, just to roughly evaluate the coherence of these assumptions. Yes, the plot is not complete. I tried to localized the beginning in the following image. It's reasonable to assume that at the beginning all the three measured temperature were at the ambient value, so the starting point would be at the convergence point of the three initial straight lines, outside the left border of the photo. It seems to me that the common starting time could be around 16:40. The common initial temperature could have been 15°C. This value is congruent with the delta T of 85°C used in the report for calculating the entalpy of the steam. It would be useful to add these three straight lines to your graphs, and to mark the time when the acquisition timestep was set at 10 s.
One last request. Please, modify the script "Reactor fully ignites" on the mark at 17:46, and the reference to a "reaction" on the final mark. They could not appear on a graph based on my indication! As for the acquisition time step set to 10s, couldn't it be that instead they/Rossi simply forgot to connect the NTC Tout sensor, given that Tin and Tamb changed value at least once at different times before that, while Tout never changed since the data logger was presumably turned on? No, sorry. The Tout sensor was connected since the activation of the data acquisition system, otherwise there wouldn't be any initial straight line, because the plotting program wouldn't have had any starting point to draw it. As for your explanation, if you are talking of the apparent values on the screen, all 3 temperatures changed. Tout changed its apparent value (crossing the pixel lines) many times at a regular pace, which denotes its linear trend. The other two, Tamb and Tin, changed only one time, as you noticed, so we have only 2 horizontal segments for each curve. This behavior is also compatible with a straight line, even if it is not sufficient to confirm it. In order to avoid any confusion with my interpretation, the UniBo descriptions could be superimposed to the upper graph, possibly with a different color of the text. - just for completeness, I would also mark the reduction of the power and its complete switching off . This depends on how that data logger operates. I guess it has to be seen in practice with the same hardware. Another possibility is that the sensor might have been disconnected for some reason after the acquisition device was first turned on. Why would Tout have increased linearly like that, anyway? Shane, thank you for your opinion, but, for sake of frankness, let me reassert mine. Since Doral, I do not believe any publicly released result from a Rossi demo. That includes the two tests at UOB being discussed. Nobody believed any result from an Ecat test thanks to Rossi. The tests being discussed were not "at" UniBo (they were carried out at a Rossi's warehouse), they were "of" UniBo, i.e. carried out under their scientific responsibility. They have been documented by UniBo, their results were guaranteed by the competence of UniBo personnel, and whoever believed those results trusted UniBo, not Rossi. Neither do I think Levi, and those assisting him, ever expected their results to be taken as the final word either. But this is not a justification for having diffused false data. The fact that a test is only preliminary does not authorize to use invented data in reporting its results, especially if this report is prepared with the scope of releasing it as an official document of a University. It was well known that that report would have been spread throughout the world in order to propagandize the existence of a technology that, if real, would have resolved the most severe problems of the humankind. All the people involved at whichever title on this activity should have had managed those information with extreme care and scruple. Oh, yes, this is well known. Those further testing should have been financed with 500,000 Euro promised by Rossi. Is this a good reason for a University to issue a faked report? … which they accomplished first at Ferrara with the Hotcat, and again at Lugano. No, the Ferrara and Lugano tests were not the tests that, at beginning of 2011, were foreseen to be carried out with the official involvement of UniBo. They were private tests, carried out after the official withdrawal of UniBo from the contract with Rossi in January 2012 (too late, unfortunately). They were for private purposes, with the participation of some academicians from a couple of European Universities, who used their affiliation to give more credibility to the published results. Lugano was a clear bust, and since it was a follow-up to Ferrara, I must conclude Ferrara was a bust also. I'm sorry, but an inference reasoning doesn't work this way, it should start from the beginning, from the Bologna demo. This first public appearance was not a bust, that is a failure of a fair attempt, it was instead a success, an incredible successful deception. 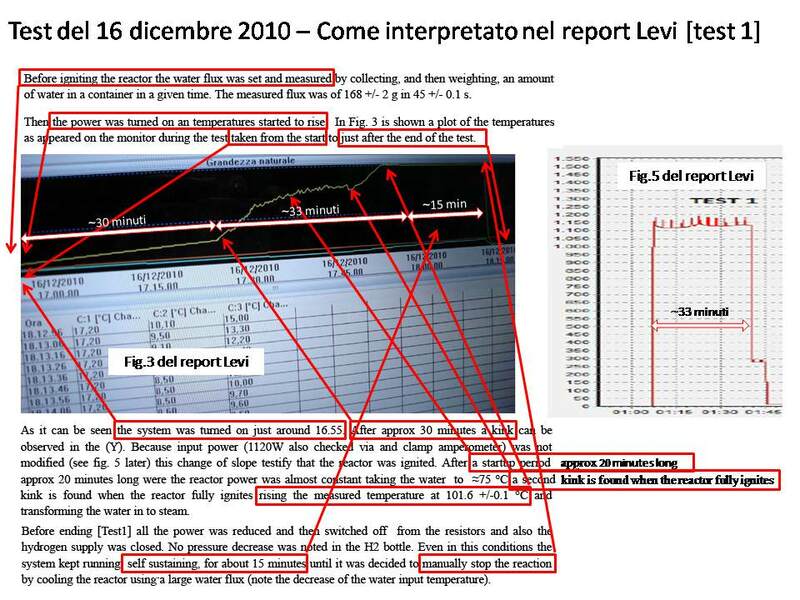 The Bologna demo and the previous December test were clearly deceptive, so it should have been concluded, in lack of any explanation about the reasons of these deceptions, that any other successive test (including Ferrara and Lugano) should have been considered deceptive as well. Even though no one has determined yet what particular trick Rossi pulled there. Once again, why do you attribute the sole responsibility of the tricks to Rossi? How do you know it? I do not think there was any intentional attempt during any of the tests, by those from the UOB to manipulate the data. I don't know. A scientific test does not only include the few hours during which the specimen is operated and the data collected. It also comprises the earlier preparatory phase, and the subsequent reporting activity. Do you think that the experimental data have been reported correctly, and with the correct interpretation? For the same reason you said before. Probably we are saying the same thing with different words. Imagine that when the system was started, the acquisition timestep was already set at 1 hour or more. The system took immediately the first record, where all the temperature were at the ambient value. Then it didn't take records anymore, until it was realized that it was not indicating any increase of temperature, notwithstanding the heaters were powered on. At that point the timestep was set at 10 s, and the system took its second record, and began to take all the others at a 10 s pace. From the first record to the second one the system drew three lines, of which the Tout one is the only evident. It seems to me that it is a much more straightforward explanation than "the sensor might have been disconnected for some reason after the acquisition device was first turned on." Anyway, this is not a big problem. If you prefer, the mark at 17:24:30 could just indicate the "Beginning of the real data" or something similar. For what it's worth, roughly 11 minutes passed between updates in the other two channels. They are not real updates, that is modifications of the values of the recorded data. There was not been any recording between 16:40 and 17:24, and hence no update. Those two jumps are only the effect of the discretization of the representation of two lines on the pixel matrix of the screen. So the instant in which one represented line jumps from a pixel line to another depends on its inclination. The same happens for the Tout curve, where the line was more inclined, so that there are many jumps, at a constant pace. It didn't initially look to me that they have a linear trend from the starting point (when the data logger got switched on, not shown here) to the red line but admittedly with so few pixel-sized jumps it's very difficult to tell for sure, so I guess I have to assume that there wasn't any real data update inbetween. EDIT: so here's the graph with the updated labels. The post was edited 1 time, last by can ( Jul 10th 2018 ). You freely use terms like "false data", and "fake report", and we know without saying who , and what you are referring to. Not Rossi for those tuning in. As I said before, I do not believe there was any intent to alter data. so I am not willing to go there with you. However, you appear to be making a solid case the data was wrong...therefore the tests conclusions were also wrong, along with some odd blips, or two. So unless some of those here with the background refute what you are so well demonstrating (with Cans help), I will assume the tests were simply failures as you say they were. And now the old and big question. Is one of these two alternative interpretations quite convincing for you, or you have a third explanation of what happened in that occasion? You freely use terms like "false data", and "fake report", and we know without saying who , and what you are referring to. Not Rossi for those tuning in. "False data" and "fake report" are judgments on things (data and report), not persons. Furthermore they are scientific evaluations, not legal. You know how many times harsh legal judgments on persons (well, just on one) appeared on this forum, I never used them. As I said before, I do not believe there was any intent to alter data. so I am not willing to go there with you. OK, I understand, that's a prudent behavior in your role of moderator. It is also the best one to be adopted for anyone else that has not enough background for scientifically evaluating the many evidences available for these first tests. However, you appear to be making a solid case the data was wrong...therefore the tests conclusions were also wrong, along with some odd blips, or two. I would say more. The tests were manipulated, the main data were invented, so the test conclusions were faked. So unless some of those here with the background refute what you are so well demonstrating (with Cans help), I will assume the tests were simply failures as you say they were. OK, thank you for your trust on my conclusions, but I need to better specify my thought. I didn't say they were failures, I said they were successes. You know, it depends on the purposes, and there is no doubt that the Bologna demo was a big success for the aims of many people of the LENR community which supported the Ecat initiative. Shane D. I thought we would arrive at this point sooner or later. McKubre said in his ICCF21 speech, the LENR community does *not* collaborate, coordinate, and communicate now, nor have they ever. Yet you are saying they did exactly that in 2010/2011 to turn a failed Ecat test, into a "success". As you said in another post: to spur on sorely needed funding for the field. IMO, it would be easier to herd cats, than to get them on board with such a silly conspiracy. I think the main question is why setting up (also with Levi's collaboration) such a sloppy yet precise test when there would have been much more convincing ways to describe one that produced abundant excess heat from LENR? Putting aside playing tricks with input power measurements, with so much E-Cat mass (about 30 Kg reported here) it could have been easy for Rossi to simulate—at least during these early short tests—excess heat bursts with some sort of slow-burn thermite charge (energy release of a few Mj/Kg depending on the type). While I wouldn't put anything past Rossi, this idea was discussed extensively on various forums at the time and the consensus was that it was improbable. It would have been difficult, dangerous and imprecise. And why do it when you can easily cheat with misplaced thermocouples and fancy footwork with the input power measurement. Absent an independent test with a blank (empty) reactor like Darden did by accident, it would be hard enough to detect that type of spoofing so why mess with something like thermite? Levi et all measured the ACTUAL output. And, yes ... it IS greater than the specification. But calibration beats specification every time. The thermite idea is a canard. Even 'slow thermite goes too fast - because the reaction rate rises with temperature, and in any substantial mass of thermite the temperature rises very fast indeed - not to mention the pressure wave it causes. And slow thermites require high ignition temperatures. Here's an experiment I did showing what happens.